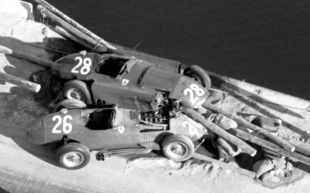 The Monaco Grand Prix - officially the European Grand Prix - underlined Juan Manuel Fangio's authority but the weekend was overshadowed by the death of Alfonso Portago and Edmond Nelson (and nine spectators) three days earlier when their Ferrari crashed during the Mille Miglia. The deaths reminded Fangio of his advancing age - his rivals were all now young and British - and he reflected years later: "They called me the Old Man and I suppose I was …they could have been my sons but they did not have the experience in racing I had." Fangio used his experience well, reckoning the Brits would all race hard and in the tight confines of Monaco that played into his hands. He did not have to wait long. 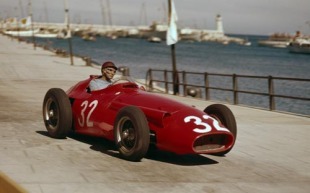 The pace setters were Fangio, Stirling Moss, Tony Brooks, Mike Hawthorn and Peter Collins, and on the fourth lap Moss braked too late on the entry to the harbourfront and ploughed his Vanwall into sandbags. Collins was too close and could not avoid crashing into the barriers. Fangio had given himself a little more room, and so was able to weave through the wreckage, but behind him Brooks braked hard and was rammed from behind by Hawthorn's Ferrari which skewed into Collins' crumpled car. Brooks was the only one of the quartet still racing who started closing on Fangio. 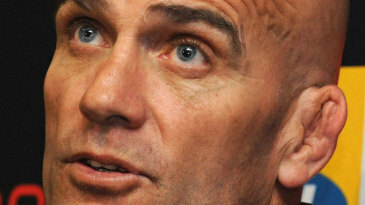 "I decided to pile on the pressure so he would lose heart," Fangio said. "As the laps went by he could see he was not gaining and he eased off." Brooks still gave Vanwall its first podium, while Wolfgang von Trips lost a certain third when his engine blew and a young Australian called Jack Brabham was in sight of a podium when the engine of his Cooper cut out. It was very nearly the first world championship points for a rear engined car. As it was, he pushed it home for sixth. Third place went to Maserati's bespectacled American, Masten Gregory. In doing so, Gregory became the first American to stand on a championship podium while British driver Stuart Lewis-Evans, managed by a young Bernie Ecclestone, finished fourth.